Barn Owl (Tyto alba). Taken at Farmoor, Oxon., on April 1st 2018. Taken at Farmoor, Oxon., on April 1st 2018. A medium-sized owl, with long wings and legs. It has a characteristic heart-shaped face. It generally has buff/brown upperparts, and white underparts. The Barn Owl is widely distributed in Europe and the British Isles. It breeds in farmland with scattered copses, gardens, rarely in villages close to fields. 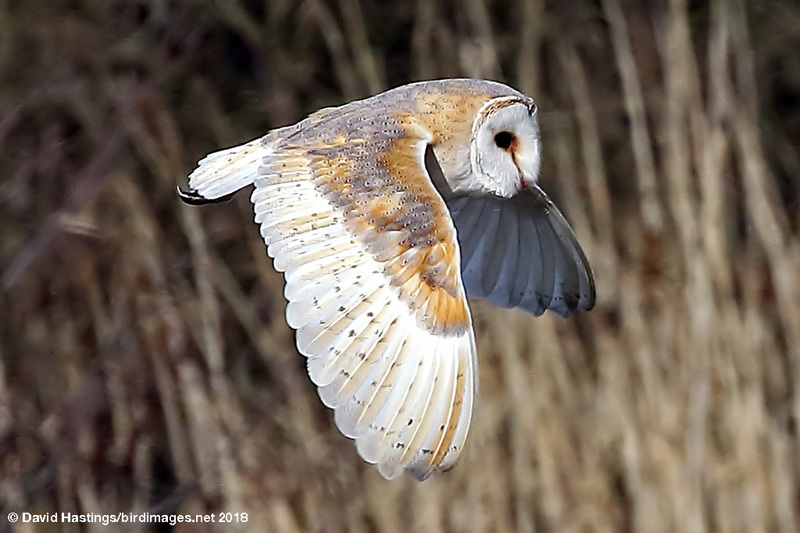 Barn Owls often hunt at dusk, or even during the day if they have young to feed. It has green status on the UK list, but only about 4000 pairs breed here.